There are various opinions as to what the Black Stone actually is. 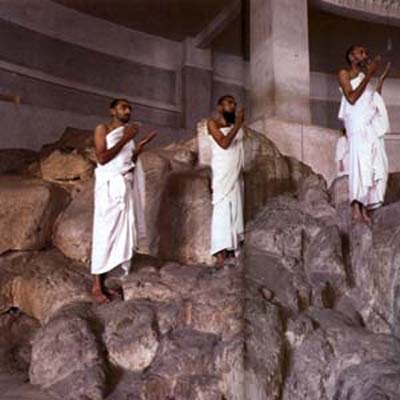 Muslims say that the Stone was found by Abraham (Ibrahim) and his son Ishmael (Ismail) when they were searching for stones with which to build the Kaaba. They recognized its worth and made it one of the building’s cornerstones. There is no indication as to where this stone originated, but since it pre-dates the revelation of the Holy Qur’an and Muhammad’s prophethood, and even kissed, it must stem from the time of Abraham since the Hajj traditions are traceable to the patriarch of monotheism. 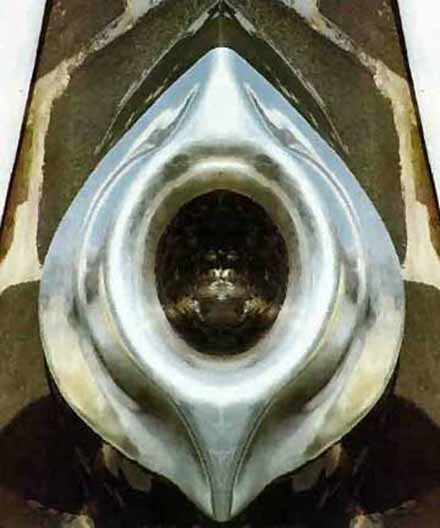 The Ka’bah at Mecca describes the shape of the black stone structure on a marble base which stands in the centre court of the Great Mosque, Masjidul Haram, at the centre of Mecca. It stands about 50 feet high by about 35 feet wide. Set into the eastern corner is the sacred stone. This Ka’ba is a cubed shaped temple rebuilt by Abraham and his son Ishmael. Reverently draped in black cloth throughout the year, it beckons to every Muslim of the world to come to its sacred ground. The Ka’ba – Kaaba – is the canonical center of the Islamic world and every pious act, particularly prayer, is directed toward it. Once a year it plays host to the greatest convention of religious believers and stands ready to sanctify the Umrah traveler through the balance of the year. The official starting point of the walk around the Kaaba, that forms the core of the holy pilgrimage, is called the hajj. 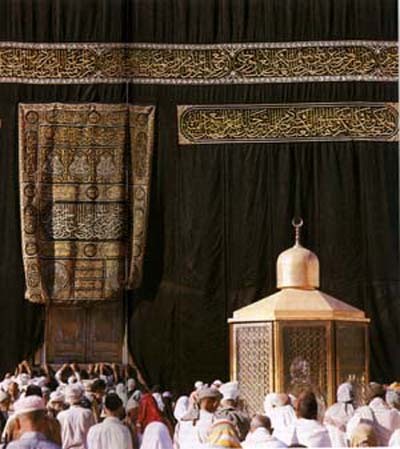 During the Tawaf pilgrims kiss or touch the black stone as they circumambulate the Ka’ba. Point of departure for the procession. 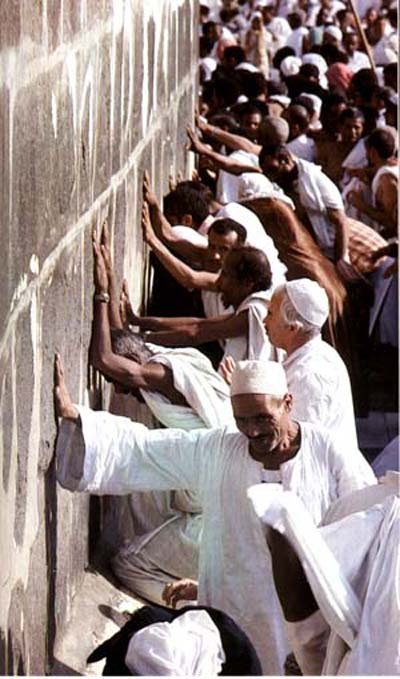 Pilgrims touching one of the walls of the Ka’bah. 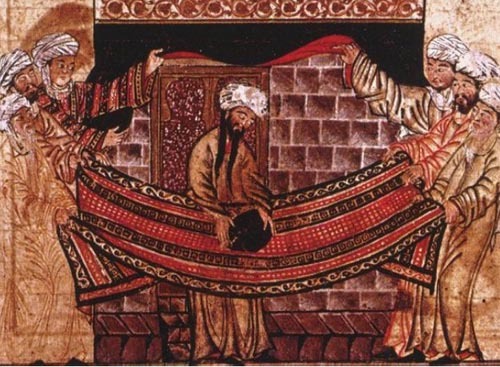 It is remarkable, however, that even though the temple contained 360 idols worshipped before Muhammad’s Prophethood, the black stone was never kissed or made an idol of worship. In fact, the Ka’ba was never worshipped by the idolaters prior to Muhammad’s Prophethood. The building contained idols of worship but the building itself was never an object of worship. The fact that the Ka’ba was rebuilt by Abraham is a historical fact. Since the stone has been there ever since, it stands to reason that Abraham placed the stone in the Ka’ba. 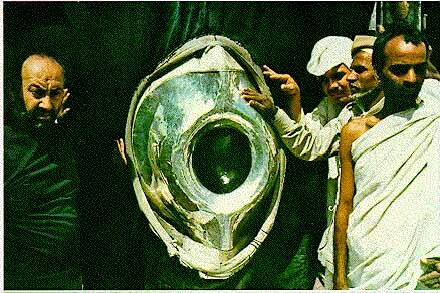 The Black Stone is in fact the cornerstone of the Ka’ba and is there as an emblem of the progeny of Abraham which was rejected by the Israelites and became the corner stone of the Kingdom of God. The stone which the builders refused is become the head-stone of the corner. Ishmael was looked on as being rejected by God, or so the Israelites believed. Yet it was a progeny of Ishmael that the Last Prophet, the ‘head-stone of the corner’ was to arise. The single most important reason for kissing the stone is that Prophet Muhammad did so. No devotional significance whatsoever is attached to the stone. Kissing or touching the Black Stone is a reverential act of acknowledgment that God’s hand directed its placement and construction. That Abraham and Muhammad, God’s blessing upon them, had touched and kissed the stone and an acknowledgment that God had entrusted the ‘corner stone’ of His religious central focus for man upon that hollowed and sacred place. Researchers have noted that the Ka’bah is accurately aligned on two heavenly phenomena – the cycles of the moon and the rising of Canopus, the brightest star after Sirius. 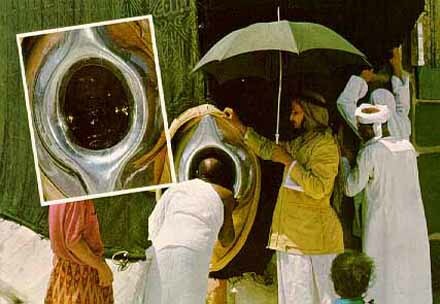 There are various other opinions as to what the Black Stone actually symbolizes. Many Muslims regard the Stone as ‘just a stone’. When Umar ibn al-Khattab, the second Caliph, came to kiss the stone, he said, in front of all assembled: “No doubt, I know that you are a stone and can neither harm anyone nor benefit anyone. 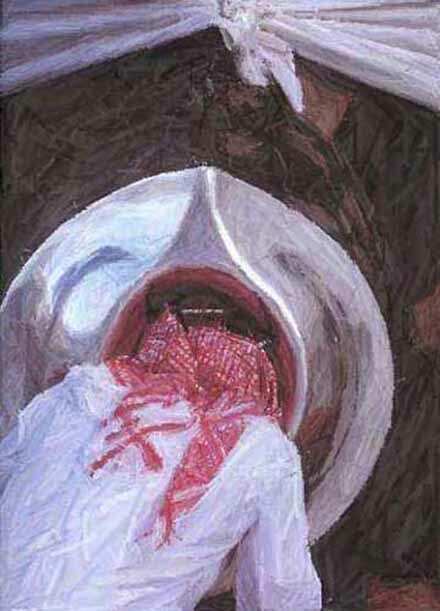 Had I not seen Allah’s Messenger kissing you, I would not have kissed you.” They pay their respects to the Black Stone in a spirit of trust in Muhammad, not with any belief in the Black Stone itself. Other Cultures and DietiesThe earliest reference we have to a goddess worshipped as a cube-shaped stone is from neolithic Anatolia. Alternatively, ‘Kubaba’ may mean a hollow vessel or cave – which would still be a supreme image of the goddess. The ideograms for Kubaba in the Hittite alphabet are a lozenge or cube, a double-headed axe, a dove, a vase and a door or gate – all images of the goddess in neolithic Europe. Deities of other cultures known to have been associated with black stones include Aphrodite at Paphos, Cybele at Pessinus and later Rome, Astarte at Byblos and the famous Artemis/Diana of Ephesus. The latter’s most ancient sculpture was, it is said, carved from a black meteorite. The earliest form of Cybele’s name may have been Kubaba or Kumbaba which suggests Humbaba, who was the guardian of the forest in the Epic of Gilgamesh – the world’s oldest recorded myth from Assyria of circa 2,500 BCE and, as scholars reveal more of the text as the source of most of the major mythological themes of later civilizations. The origin of Kubaba may have been kube or kuba meaning ‘cube’. The stone associated with Cybele’s worship was, originally, probably at Pessinus but perhaps at Pergamum or on Mount Ida. What is certain is that in 204 BCE it was taken to Rome, where Cybele became ‘Mother’ to the Romans. The ecstatic rites of her worship were alien to the Roman temperament, but nevertheless animated the streets of their city during the annual procession of the goddess’s statue. Alongside Isis, Cybele retained prominence in the heart of the Empire until the fifth century BCE – when the stone was then lost. Her cult prospered throughout the Empire and it is said that every town or village remained true to the worship of Cybele. The home of Aphrodite was at Paphos on Cyprus. Various Classical writers describe the rituals which went on her in her honor – in which a tapering black stone, the object of veneration at her temple, was used. Next Post Here are 7 Ways to Make CBD Oil Work Faster!